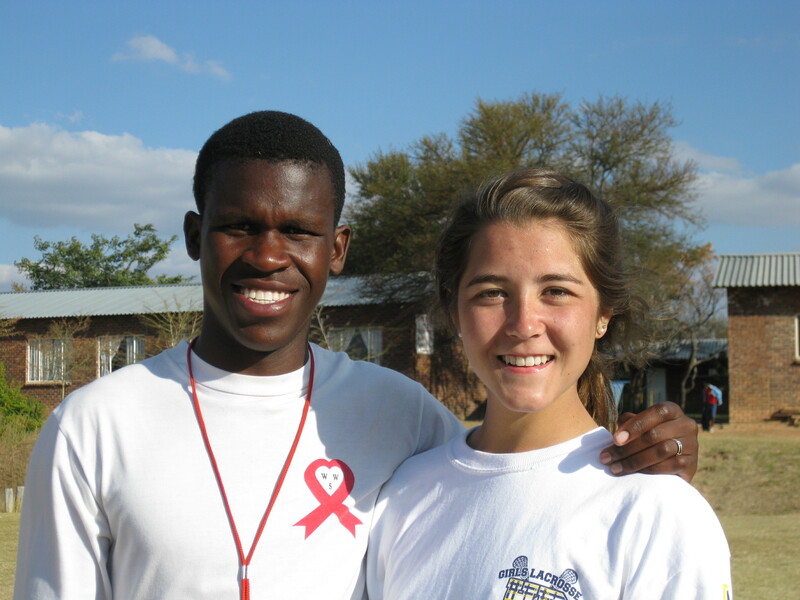 Many of The Wilson Foundation’s friends and supporters have heard about Simon Makinta, the young man from Leseding Township who we have been helping for the past several years. Just over two years ago, Simon was a young man with big dreams but no way to achieve them. 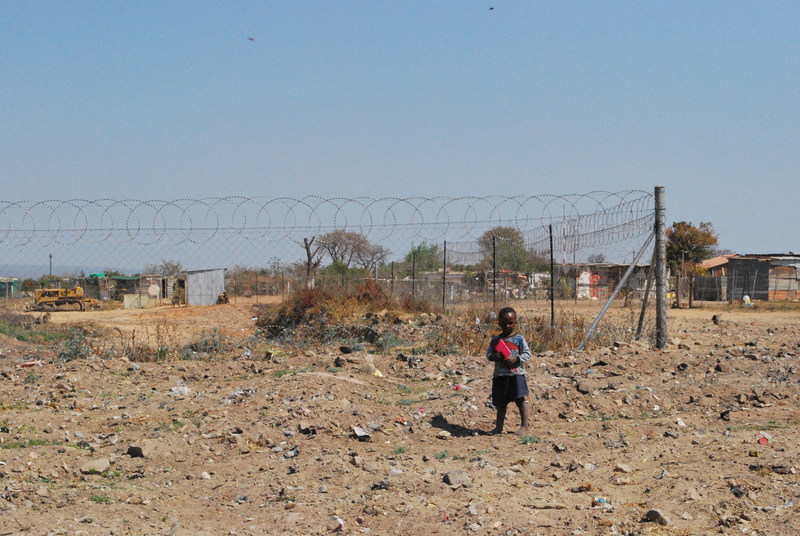 He had just graduated from Meetsetshehla High School in Vaalwater and had no prospects for employment. 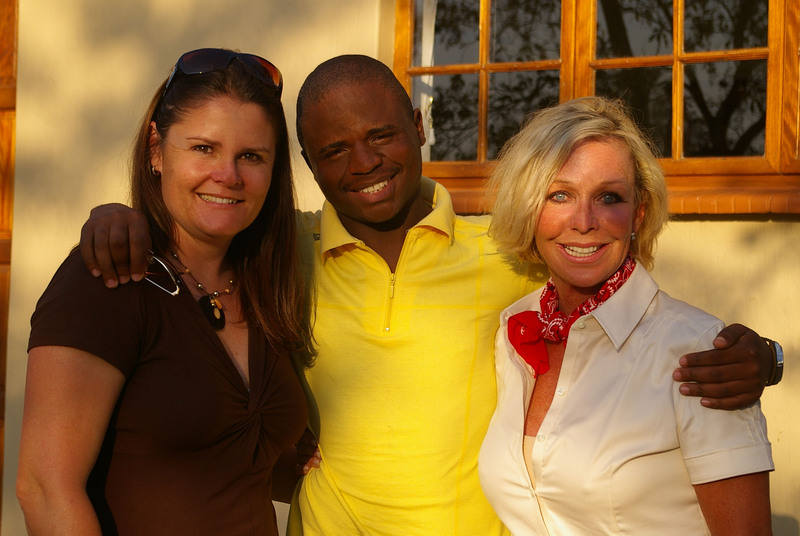 After meeting Trisha Wilson and Marion Frew, our local Wilson Foundation colleague in Vaalwater, Simon persuaded the foundation to help him further his education and pursue his dream: to fly. With funding support from The Wilson Foundation, Simon graduated from Jeppe College in March with a hospitality degree. The next step was to attend a cabin crew training program. He completed his course last week and today we received word that he has passed his Civil Aviation examination so he will become licensed to work for an airline! It hasn’t been easy: along the way, Simon was mugged (twice) and robbed of everything he had. Since English is not his first language, he struggled to understand the material in some of his classes. He often did not have enough money for food. To enroll in cabin crew training he had to learn to swim proficiently. All these things he accomplished while living away from his family and familiar surroundings. The one constant throughout his journey has been the support of The Wilson Foundation. Having the local ‘on the ground’ support of our representatives Marion and Angus Frew has enabled the Foundation to manage its grant programs efficiently and where necessary, provide additional assistance and help. This certainly made the difference with Simon, as Marion was there to guide and encourage him along the way. For Simon Makinta, the sky’s the limit! 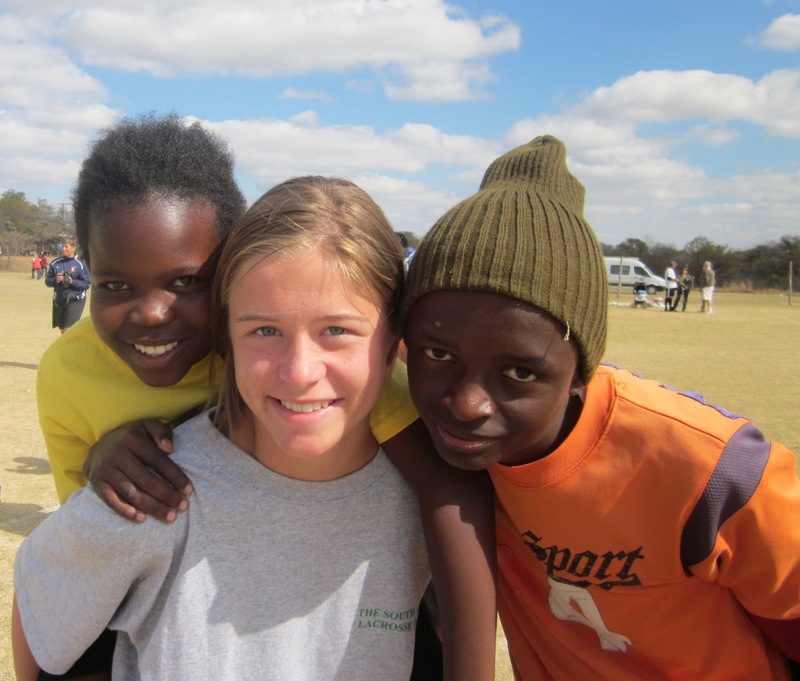 People often ask how and why The Wilson Foundation began focusing its work in South Africa. If you ask our founder, Trisha Wilson, she will tell you that when she first arrived in South Africa, it felt like home: the climate, the terrain, the people- all reminded her of Texas. The first time I went there, I understood what she meant. This is truly a special part of the world: a country rich in natural resources and beautiful, friendly people with a wonderful spirit. It is also a country that has suffered from a poor education system, staggering unemployment, a critical shortage of trained medical personnel, and thousands of children who have been left orphaned by the HIV/AIDS pandemic. 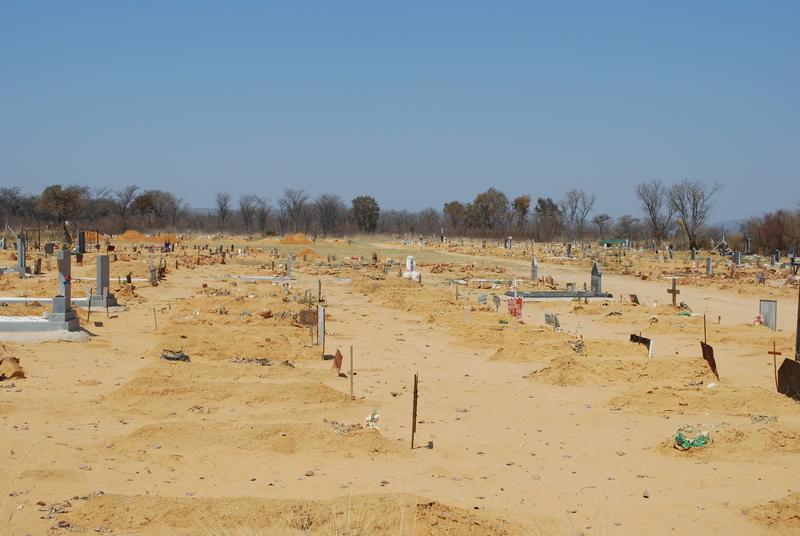 The community of Vaalwater, South Africa has a population of about 35,000, including the sprawling Leseding Township, and an additional farm population of about 10,000. 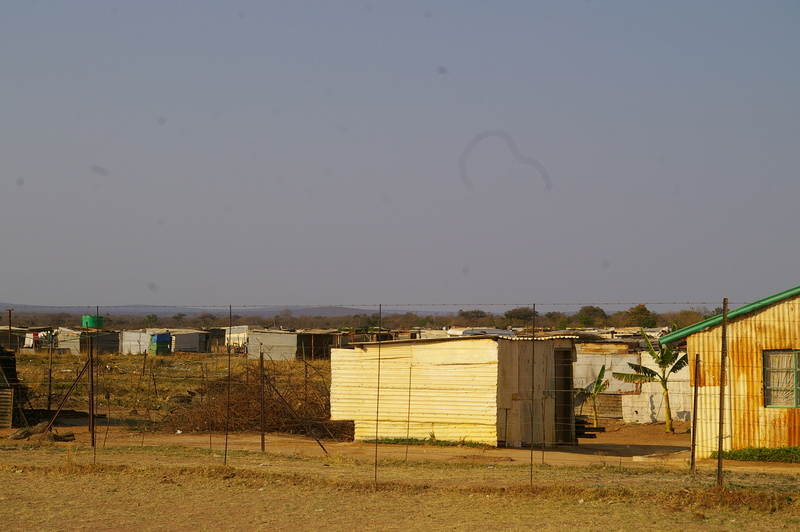 Commerce in this region is mostly limited to agriculture and eco-tourism, with many game reserves located in the area. There are not many other ways for people to make a living, hence the high unemployment rate. Over the past several years we have found that by focusing our efforts in one specific geographic region we are able to see and monitor the difference we are making. 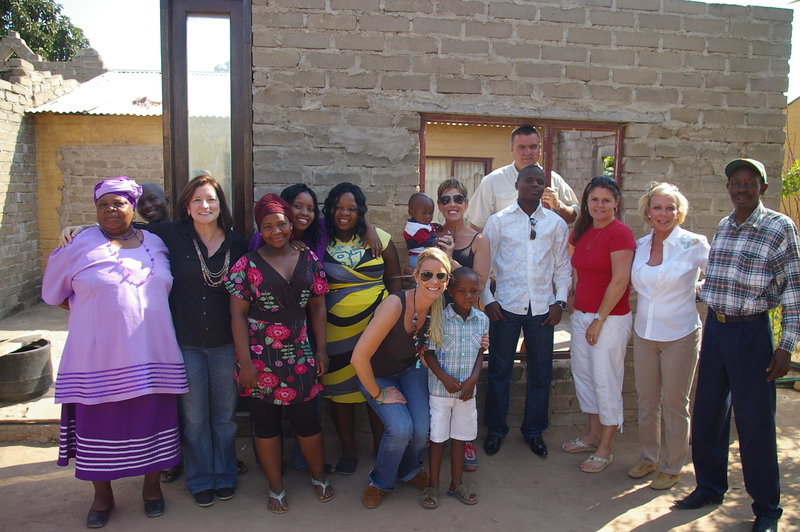 Here in Vaalwater, we are the only US-based nonprofit that is funding programs on a year-round basis. Because we have board members who live in the local community, we are able to monitor the effectiveness of our grant dollars and, where needed, make corrections or adjustments. We have had the privilege of working side-by-side with several community-based organizations from their very beginning. These organizations are focused on working with stakeholders to find solutions to community needs. The result has been stronger buy-in by the community, and their success is evidenced by the tremendous growth in their programs. In my next posts I will share a bit about our most recent trip to South Africa and all we experienced during our time there. Getting on the plane to fly to South Africa, I had no idea what to expect. I had been briefed on a general idea of what the trip might involve; however, I was not prepared for the experience that I would have. Getting to spend a week with the kids of Timothy House was truly an unbelievable opportunity. 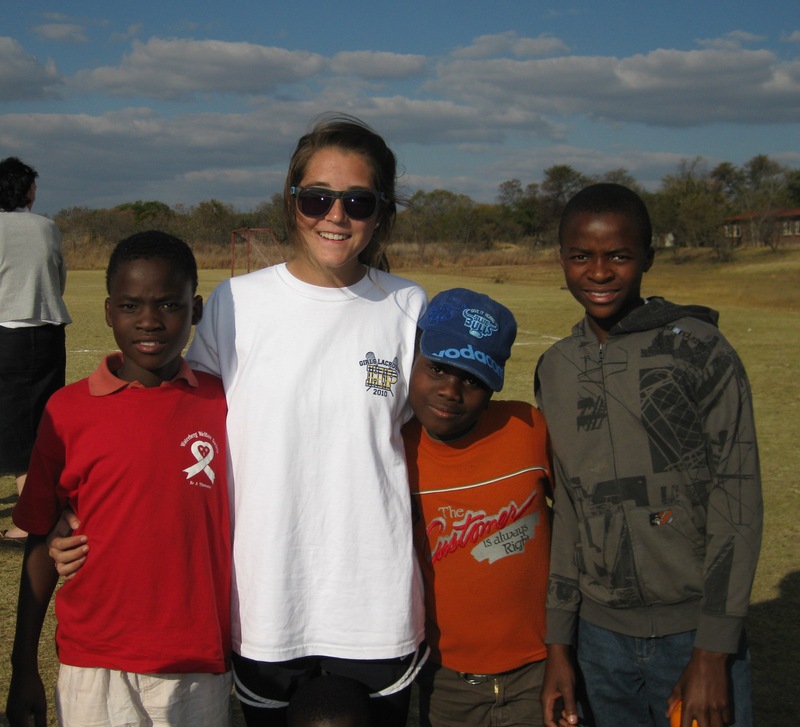 Every morning when we showed up at the field, I could see each guy and girl’s face light up as they ran over to give us a hug –they all knew us by name. The days were spent playing games, singing in line and when it came down to the drills, the girls would give everything they had. Even if they couldn’t quite understand what they were supposed to be doing, they would all respond “Yes Coach” and try their hardest. Their effort was inspiring, especially considering how exhausted they must have gotten. 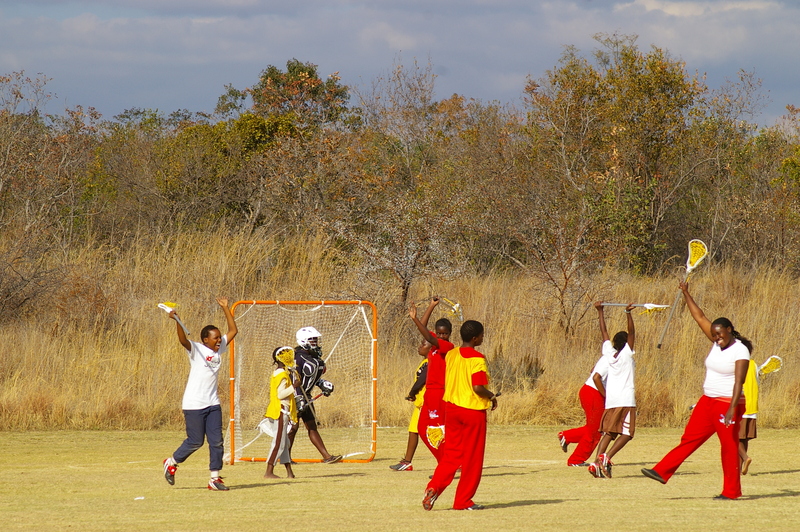 One thing that made an impression on me was that neither the language barrier nor the fact that lacrosse was a new sport for most of them hindered their desire to give us their full attention and utmost effort. As a result, it wasn’t surprising how quickly they picked up the sport. It took me over a year to be as good as most of those kids became in one week. Getting to spend time sharing the sport of lacrosse and getting to know each personality was something I would not trade for anything. There are several experiences that stand out in my mind – one was when we started out two of the mornings playing a game of ‘Freeze Tag.’ It was obvious that the kids were tired. They had walked a long way and it was early and cold; however, as soon as we started playing, each girl was sprinting her heart out to either ‘tag’ or escape the person who was ‘It.’ Not only where they working so hard for themselves, but they would risk being ‘frozen’ to ‘un-freeze’ all of their friends. If you had been tagged, you could be sure that within seconds someone would be crawling through your legs to unfreeze you. It was amazing to see that selflessness in a game so simple as Tag. I also loved how the person who was ‘It’ would always say “Touch” when they tagged you, as if you could not feel it! This simple game expressed alot about how friendly, loving and cooperative the kids were. They would do anything for us and they just wanted us to love them in return. When the week was over, we had the chance to go from teachers to students when we presented our homework assigned the Sunday before: learning and performing the Diski Dance. Although it was embarrassing how much worse we were in comparison, when it came down to American girls vs. American guys, the girls took home the prize. 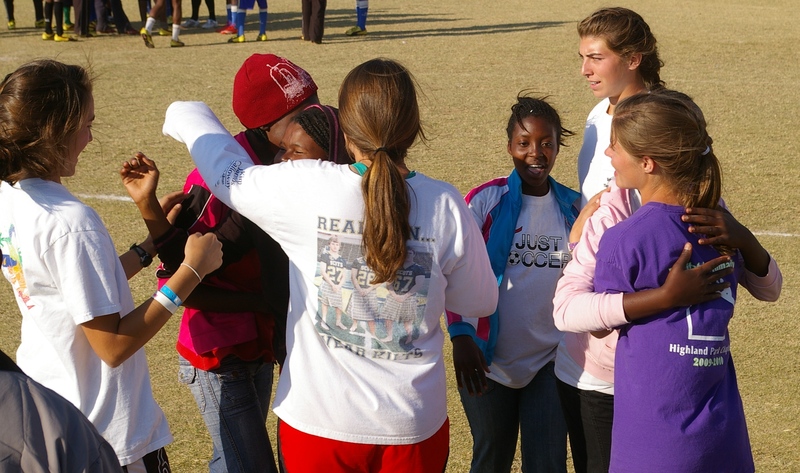 It was great to see how excited the Vaalwater girls got when we won! I had heard a lot about South Africa from my mom’s work with The Wilson Foundation and her trips there. My teammates and I had been briefed on the community where we would be working and the challenges of the children and families who lived there. We knew that many of the younger children didn’t speak English. Event though I was excited about participating in the lacrosse camp, I really wasn’t sure what to expect. 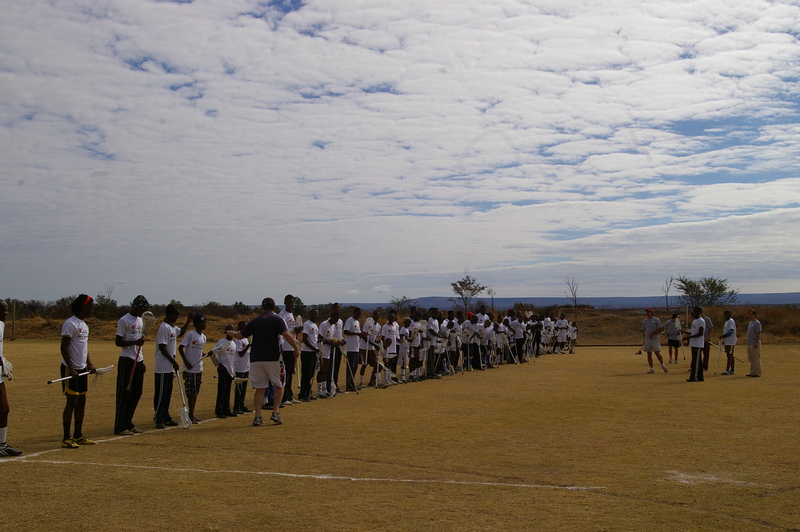 The first day, we went to the Waterberg Welfare Society to meet the kids who would be participating in the camp. It was the 4th of July and the kids surprised us by painting their faces red, white and blue and singing “The Star Spangled Banner” which they had learned just for us! 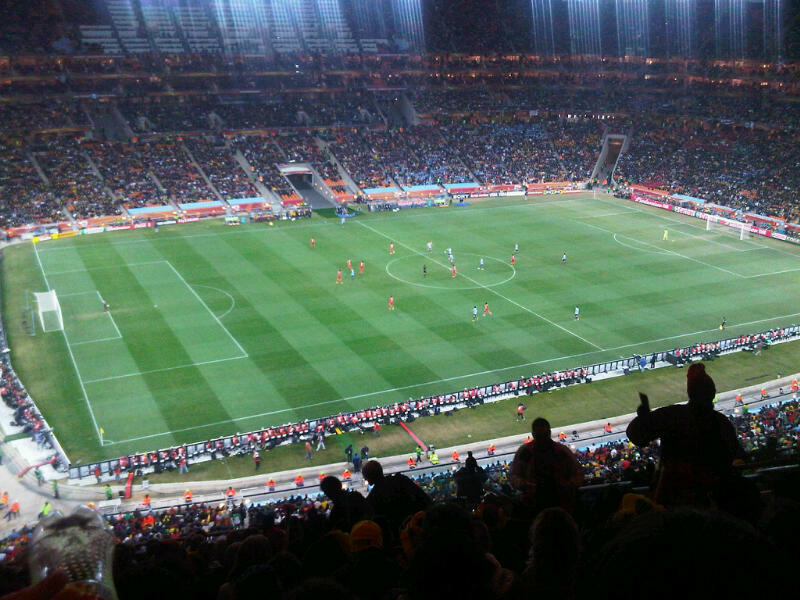 We then had our first lesson of the “Diski Dance”, the official World Cup dance. That really broke the ice for the kids and for us, and we all looked forward to the week of camp ahead. All these kids knew how to make the most of what they had, and it showed everyday on the field. They shared cleats with each other and would switch off on who got to wear them each day. They cheered for each other in drills and when taking shots. 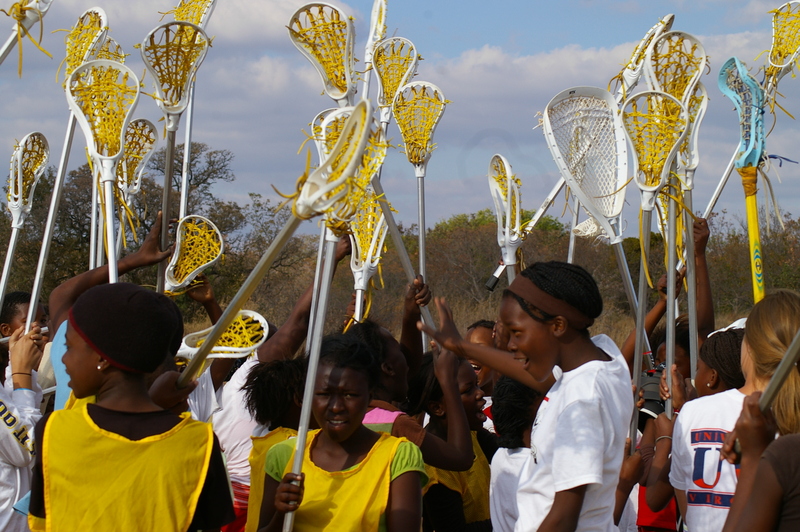 They always had smiles on their faces and were eager to learn the complicated game of lacrosse. They seemed happy no matter what they were doing, whether it was playing lacrosse, doing the Diski dance, or just braiding our hair. 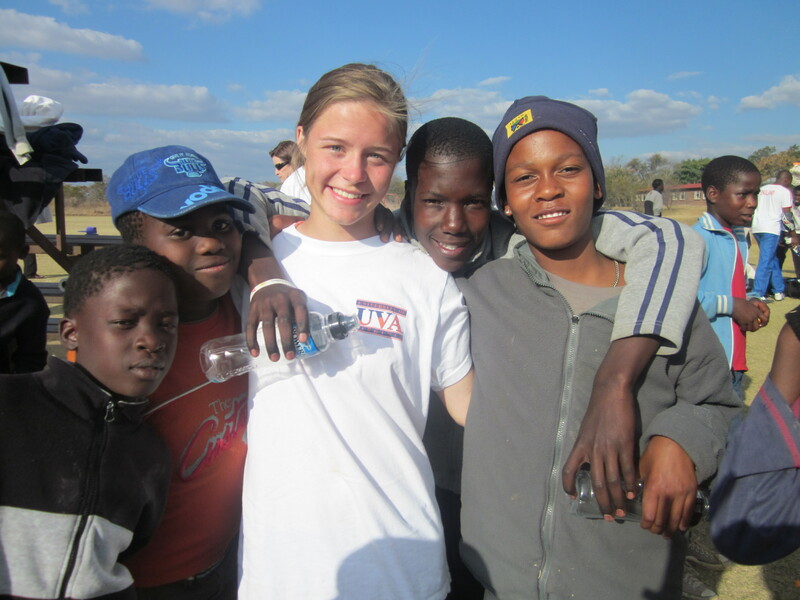 One of the experiences that touched me the most was going with Coach Xan and his Xtreme soccer team to help serve at the soup kitchen in the local township. Most of these boys come from difficult situations themselves, yet they had stayed up late the night before making hundreds of peanut butter and jelly sandwiches to serve to those kids who were less fortunate than they were. At the soup kitchen, which was really just tables set up under an old circus tent, the kids lined up politely and waited for their food. Some carried younger siblings wrapped in shawls on their backs. After going through the line once, they lined back up for more until all the sandwiches were gone. I was amazed that these boys who themselves are receiving support, were also giving back to others who were more needy. That was a really great experience. Every day after camp was over, the kids would surround the coaches and give endless hugs and ask to have their pictures taken with us. They reveled in the instant satisfaction of taking a picture and being able to see that moment frozen in time two seconds later. Something as simple as seeing a picture of themselves was a huge deal to them, though it’s something that many of us take for granted. In five short days, those children showed me how to enjoy everything thrown at you in life and to embrace it with joy and enthusiasm. It’s something I hope I will always remember. 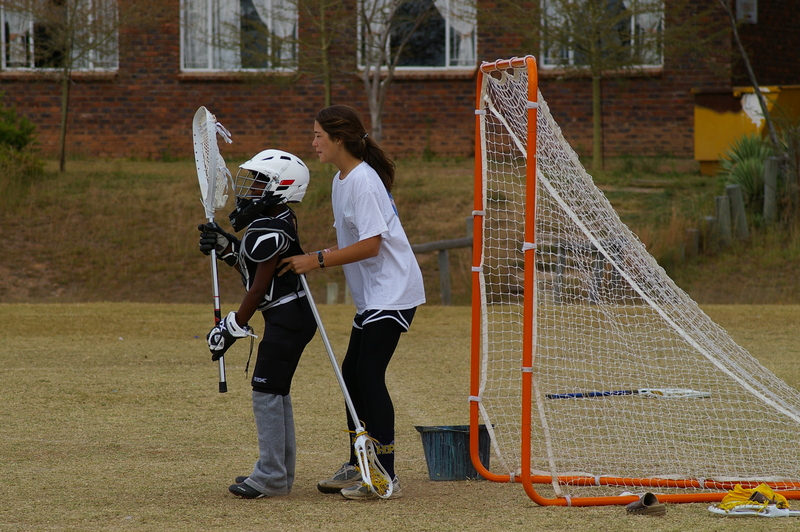 My new friend Phinius - a great lacrosse player! The morning started early today for several of us. Sue, Katie and Tom left at 6 am to go on an early morning game drive at Welgevonden with Marion and Angus Frew, who manage Trisha Wilson’s property here and who serve on The Wilson Foundation’s board. Joe and I left shortly after that to go get the punctured tire patched and repaired. The younger coaches got camp started this morning, beginning with the giant circle of kids on the field and Phinius leading the group in prayer. I am always impressed at seeing the leadership displayed by the young men of the WWS. They are wonderful role models to their peers as well as to the younger kids in the youth program. The group started off with a warmup lap around the field, and then Rachel, Bailey, Haydyn and Sarah did warm-up exercises and stretches with the girls, while Harrison, Cody and Max led warmups for the boys. By the time the older coaches arrived, the group was starting on th e day’s skill drills and scrimmages. The kids are really progressing in their games and we are all especially impressed with several of the boys and girls who seem to have just naturally picked up the game. The boys scrimmage all morning, and we cheer on Phinius as he takes on Cody, as well as the other boys who are challenging the Americans. Tom has really gotten a command of the Sotho language and yells commands and tips in Sotho. I have no idea what he is saying, but somehow, the boys do! The boys scrimmage looks better each day! Watching Sue in action is a real treat- she is always full of energy and constantly encourages, corrects, and cheers on the girls. The girls rotate in with short 7 v 7 scrimmages, and Sue calls for the next groups to take the field one after another so that all the girls have a chance to play. Bailey, Sarah, Haydyn and Katie take charge of different teams and Rachel works with the goalies. After each goal, the girls cheer each other, and each scrimmage concludes with the teams raising their sticks in unison. The day ends in typical fashion, with words of praise and encouragement from the coaches and a prayer of thanksgiving from Zach for a wonderful day. Zach reminds the kids that tomorrow is Tournament Day, with a big celebration on the Waterberg Welfare Society’s gig rig, a Diski Dance contest, and finally, a braai (African cookout) at the Farmers Hall down the road. We all leave feeling tired but exhilarated after another great day. 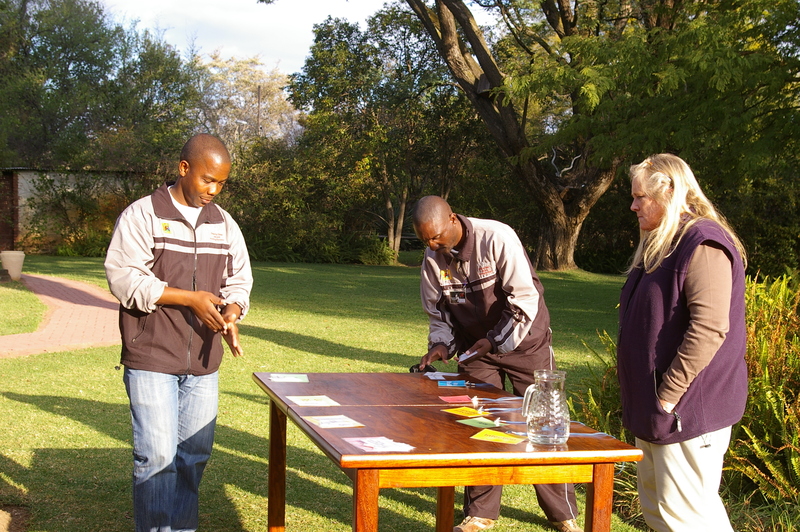 Back at the cottages after camp, Zach, July and Mary from the Waterberg Welfare Society provide a version of the HIV/AIDS education program that they regularly provide at the area high schools. The presentation includes several activities designed to point out the risk behaviors involved with HIV/AIDS and to illustrate how the HIV virus can spread among a group of people. For our American kids, it was a frank and important education about a disease that has had such an impact on people everywhere, but especially on the community where we are working. Dr. Peter Farrant, chief medical director of the Waterberg Welfare Society, concluded the meeting by providing additional information and answering questions. It’s hard to believe our week of lacrosse camp is coming to an end. We are all going to be sad to say goodbye to the kids but we are also excited about Friday’s games and the ‘Diski Dance’ contest. The American kids stay up late on Thursday night trying to perfect their best Diski Dance moves so they can keep pace (or at least try!) 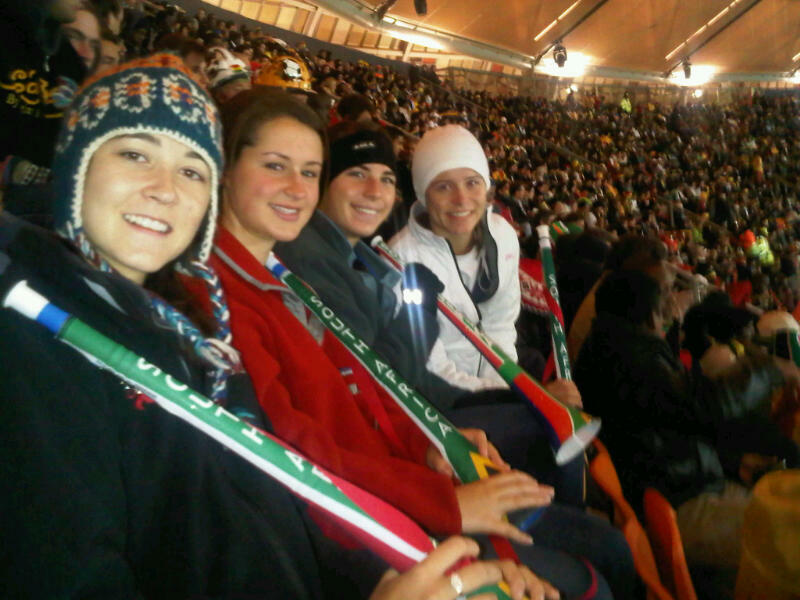 with the South Africans. During school holidays, most high schools are totally deserted. 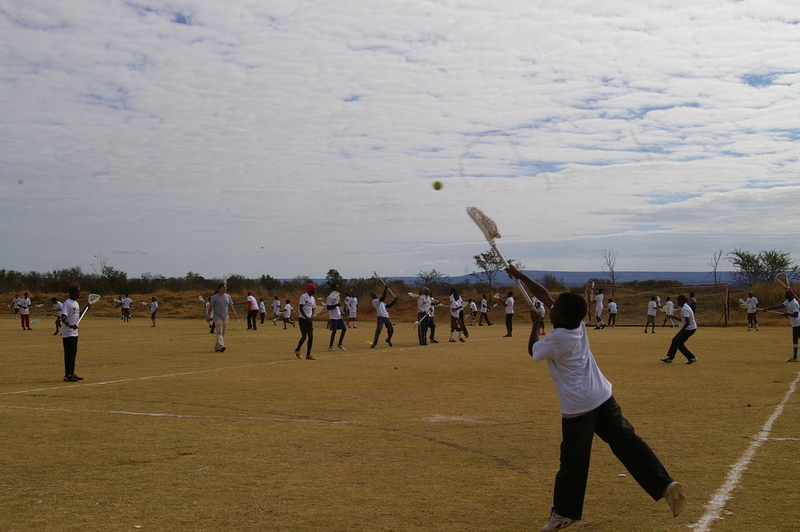 But on this Monday morning during the World Cup holiday, Meetsetshehla High School in Vaalwater was buzzing with activity. 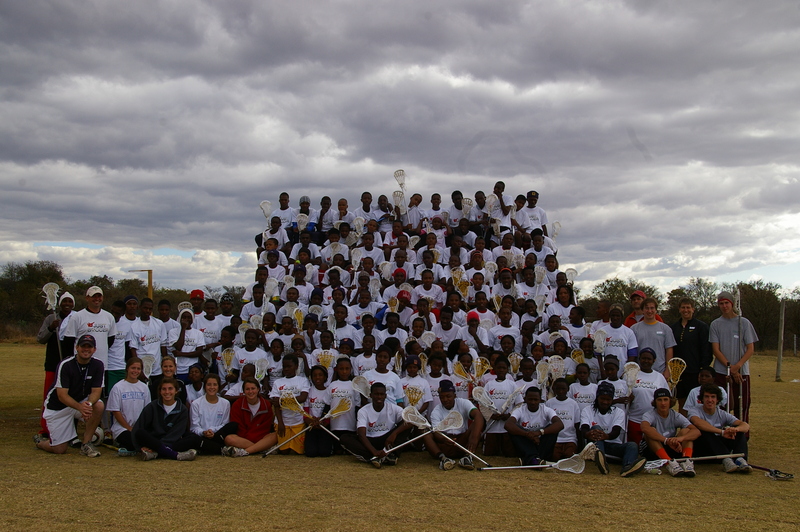 The 15 South African Lacrosse Project volunteers arrived early to finish lining the fields and laying out all the equipment, sorting out the boys’ and girls’ lacrosse sticks, helmets, gloves, goggles and pads, as well as the T shirts. The children had walked over from the WWS (a distance of a couple of miles) after gathering there for a breakfast of hot porridge. It was fun for all of us to see the familiar faces of everyone we had met the day before. 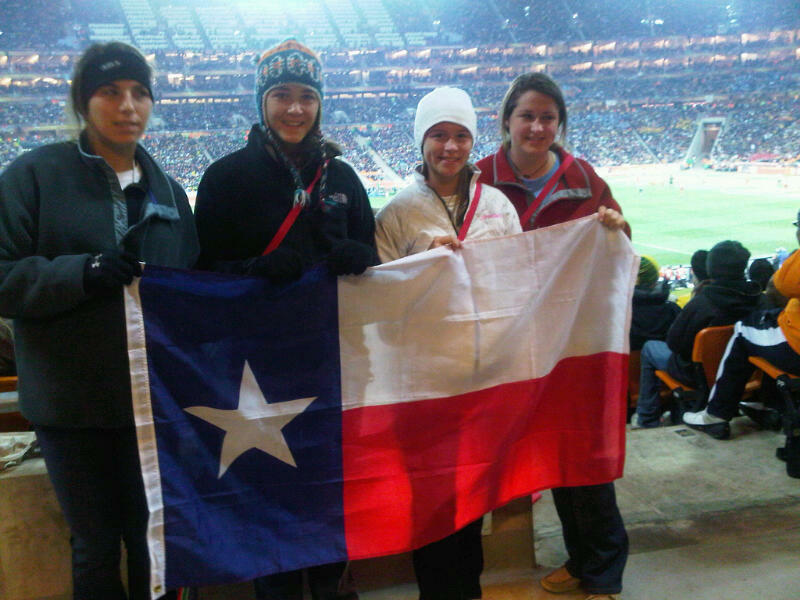 The first order of business was to give them their T shirts, which had been donated from Not Just Soccer in Dallas. After getting their proper sizes, everyone was happy to pose for a group photo. Next, the boys and girls divided into groups and went to their respective fields. Coach Sue and Coach Katie assessed which girls had attended the previous camps and then sorted the girls according to age and skill. It was quickly apparent that there were some language barriers, so two of the older girls, Sina and Johanna, were asked to help translate. From then on, the teaching began in earnest! 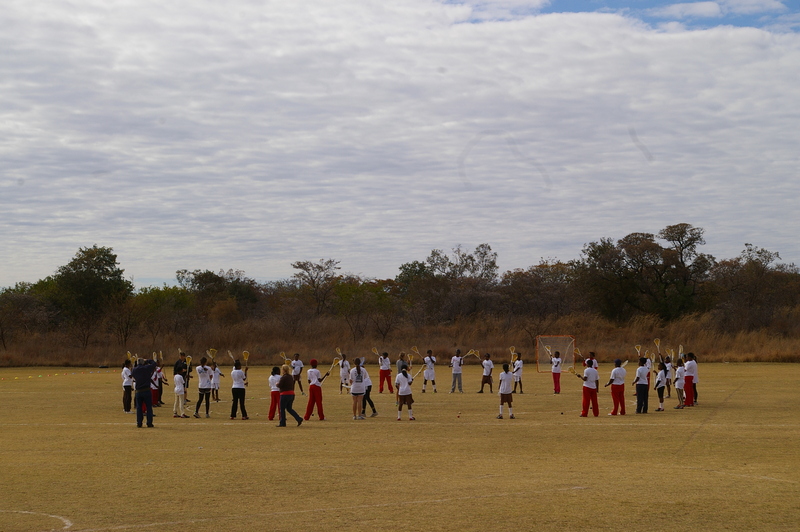 The girls worked on basic stick handling and cradling, and they also worked on ground balls. On the boys’ side, Coach Tom and Coach Mike took charge, aided by Harrison, Cody and Max. Kip circled the two group, taking photos. 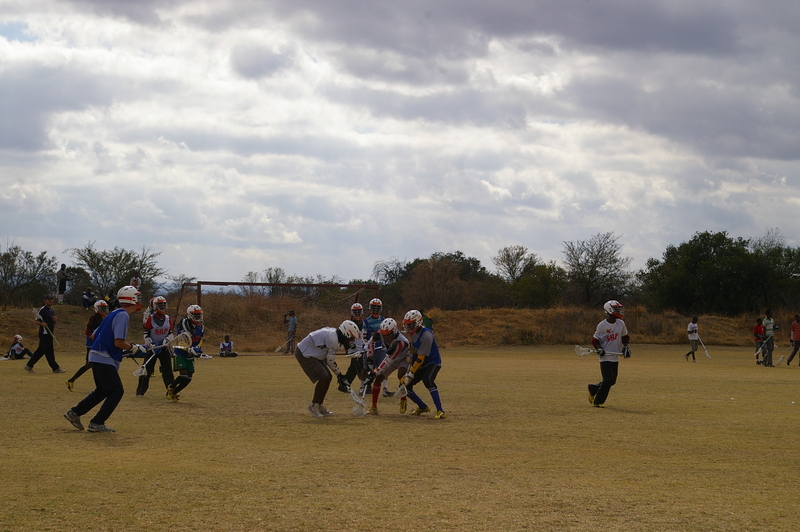 There did not seem to be many language barriers on the boys’ side, and in fact, by the end of the first day, most of the coaches had picked up a few key words in the native language, Sotho, so they could give commands in the boys’ first language. 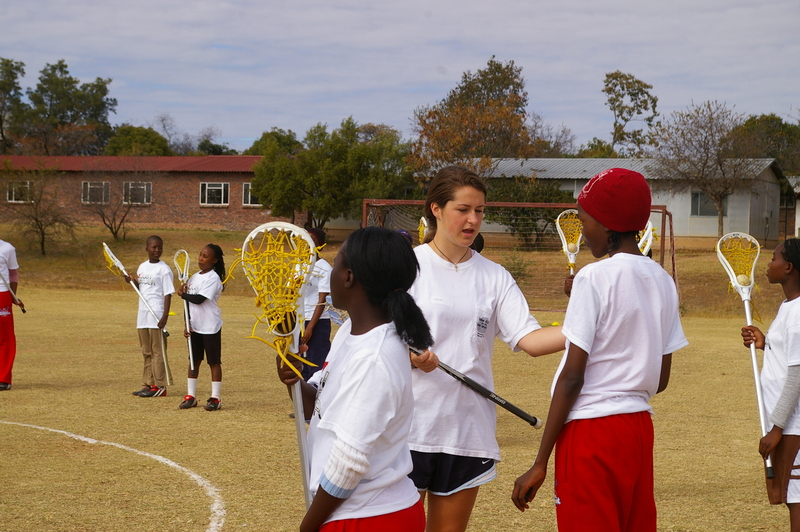 Both Sue and Tom remarked that they could tell several of the kids had been working on their lacrosse skills since last year’s camp, and there were a number of real athletes in the group. 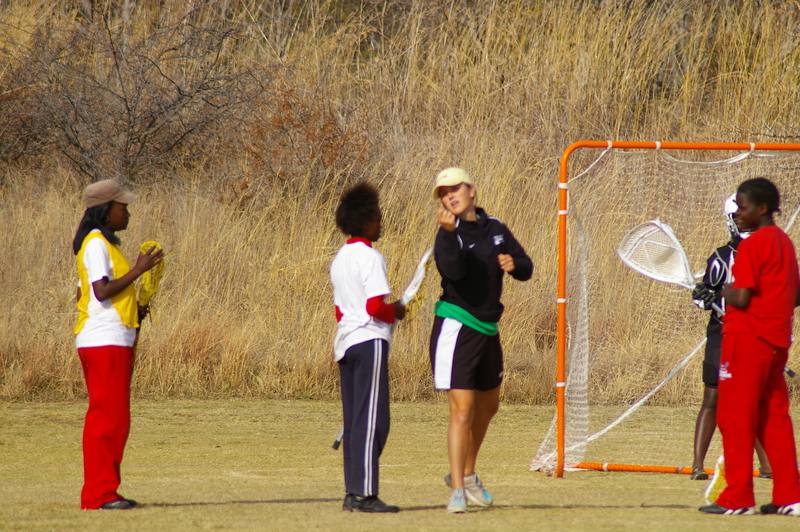 Rachel loved working with Simbisa and the other girls who wanted to try being goalies, and Haydyn, Bailey and Sarah worked with the rest of the girls on cradling, tossing and catching. Monday’s camp passed quickly, and it was hard to figure out whether the coaches or the campers had more fun. We all look forward to tomorrow! !